Newly elected Cathaoirleach Mayo Co Council Austin Francis O'Malley. 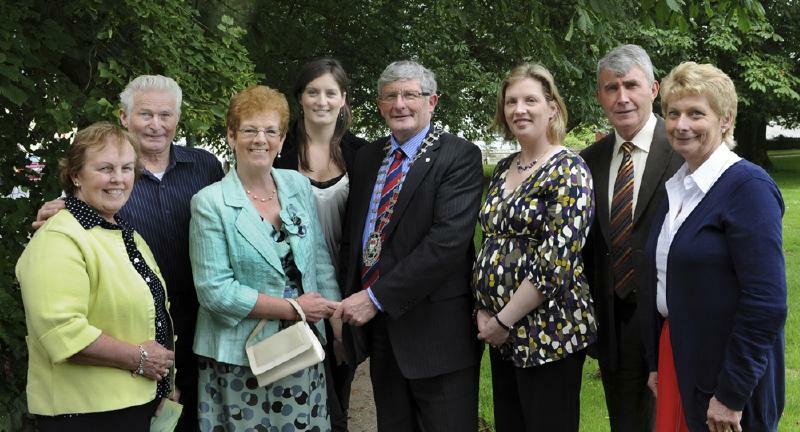 Photographed with his Wife Ceceile and Family, Peter Hynes, County Manager, Joe Beirne, Co Engineer, Eugene Lavin, Leas Cathaoirleach, Paddy Bourke, Cathaoirleach Seanad Eireann and Councillors. Photo Tom Campbell. Newly elected Cathaoirleach of Mayo County Council: Austin Francis O'Malley. Photographed with Family. Photo Tom Campbell. Newly elected Cathaoirleach of Mayo County Council: Austin Francis O'Malley. Photographed with local politicians. Photo Tom Campbell. Newly elected Cathaoirleach Mayo Co Council.Austin Francis O' Malley,Louisburgh Photopgraphed with LTO R John Condon, Co Secretary,Councillor Ml.Bourke, , Peter Hynes, County Manager. Photo Tom Campbell. Newly elected Cathaoirleach of Mayo County Council: Austin Francis O'Malley. Photographed with Family, and well wishers including Paddy Burke, Cathaoirleach, Seanad Eireann, and fellow Mayo County Councillors and local politicians. Photo Tom Campbell. Newly elected Cathaoirleach of Mayo County Council: Austin Francis O'Malley. Photographed with Family, and well wishers. Photo Tom Campbell.